Fifteen years ago in a barren stretch of the Pacific, a cruise ship collided with an iceberg and was lost at sea. More than a decade later, Hideto Yashiro—a ship engineer—died in a fatal car accident. The unlikely connection between these events only comes to light on the luxury liner St. Aphrodite during her maiden voyage. 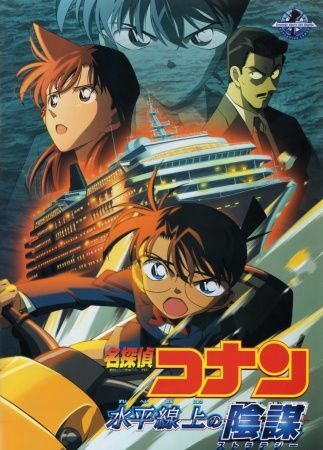 Aboard it on a much needed vacation, Kogorou Mouri, his daughter Ran, Conan Edogawa, and the Detective Boys enjoy a trip provided by Sonoko Suzuki's family. But their fun is soon cut short when a game of hide-and-seek leads to Sonoko's disappearance. Some time later, the CEO of the Yashiro group, who built the St. Aphrodite, is found stabbed to death and her father missing. While the police's investigation turns to a dead end, Conan closes in on the culprit. Unwilling to be apprehended, the culprit threatens to blow up the St. Aphrodite and sink all her passengers. As the ship's hull rapidly fills with water, the truth behind the vengeful murders is finally revealed. With no place to escape, Conan and Kogorou must wrestle with the elusive culprit before everyone on board is dragged to the ocean floor.